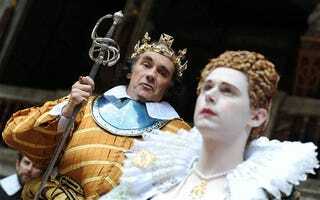 Just got back from Mark Rylance's Richard III. They were going for Elizabethan authenticity, with an orchestra of period instruments, all the women's roles played by men, the stage lit by candles and the house lights kept on half throughout, it was an interesting angle. Rylance's Richard isn't going to make me forget the bravura turn of Ian McKellan any time soon, but the show was really, really good, great ensemble work. I can't wait to see the other half of the engagement, Twelfe Night with Stephen Fry as Malvolio. Anyhoo, at intermission we're working our way back to our seats and the missus says "Hey, that's Joan Rivers" and I was like hmm, so it is. She's a rather distinctive figure, and was just talking to friends or something in the gallery behind the orchestra seats. Manhattan celebrity etiquette says leave 'em alone. But about five minutes later I look up from my aisle seat, and she's kind of inching her way around the crowds, trying to get back to her seat, but the way is blocked. I look up, she looks at me, I say "Hey Miss Rivers, enjoy the show!" She leans in, puts her arm on my shoulder, says "Oh, I'm just LOVING it. Isn't it wonderful?" I say absolutely, add "By the way, that's a great jacket" (her fancy silver-and-black jacket was what had initially attracted the missus's attention) and she waves, says "Thanks!" and is off down the aisle. So that was... interesting. I haven't followed her recent stuff, but he was kind of an early protean figure among female comics, one of the first true heavy-hitters who could headline in Vegas and guest-host for Carson. I hope she enjoyed the second act. Then we got ribs and chicken wings at Virgil's. Nom.